The somewhat unusual way to hail a cab in Russia is to simply stick your hand out into the street, as one would while hailing a cab, but without looking for the familiar lit-up taxi-sign lamp. Your goal here is simply to make a car stop. It’s a bit like hitchhiking, except you pay the driver. When a car stops, you wait for the driver to roll down the window (or you can open the door if you feel brave). Then you name your destination and your price. As a rule of thumb, it should not cost more than 500 rubles to go from one side of the city to another. Factoring in prices for those who do not speak Russian very well, it should never cost more than 1000 rubles. One of three things can happen next. The driver may agree, in which case you hop in. He may name a higher price, and you may accept or haggle further. Or he might name a completely ridiculous price at which point you walk away from the car and wait for the next person to stop. On the one hand, some might say this is not a very safe way to travel. On the other hand, this is the way that Russian people take “cabs”, and it is much cheaper than using the cab companies. Don’t forget that you must always pay these drivers in cash. If you’re wondering who the drivers are, it varies. There are some people for whom this kind of “cab-driving” is a full-time job but without the overhead of working for an official taxi company. There are others who pick people up if they have spare time, just to make some extra cash. Others only pick people up on Monday or Thursday... and so on. The method described above is fit only for the most daring, fearless, and adventurous travelers. 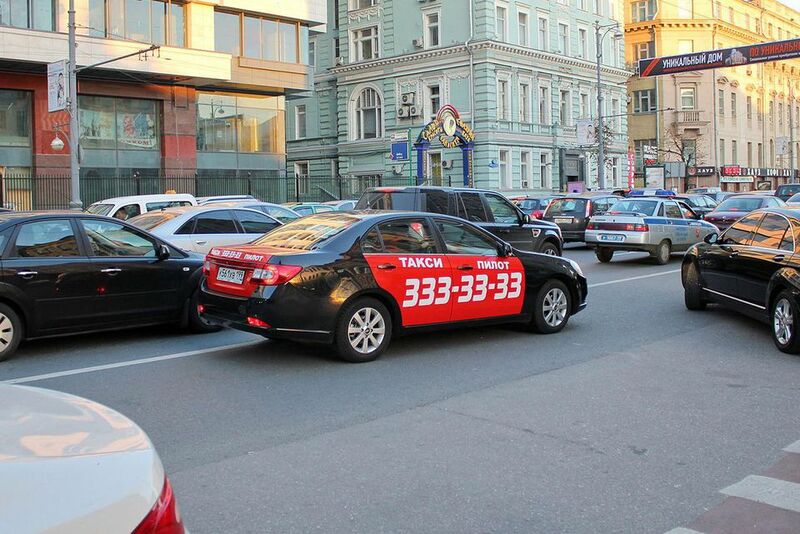 For those of you who prefer to play it safe, you can also get a taxi the traditional way in Russia... sort of. Even in major cities, unless you’re at an airport, it’s pretty rare to see cabs cruising around the streets. Most cab drivers hang out at the depots and don’t waste their time driving around the city. To order an “official” cab, you must call the dispatcher and get one to pick you up. You will have to tell them in advance where you will be going, at which point they should quote you a price. This is to prevent drivers from “fixing” the meters or otherwise trying to swindle you – so as you can see, this is a much "safer" method. Unfortunately, it can be at least twice as expensive as hailing a random car, so be prepared to pay quite a lot of money for your trip. For example, a 30-minute trip from St. Petersburg to the airport usually costs at least 1000 rubles on a “real” taxi but at the very most 700 in an “alternative” cab. It's recommended to learn some Russian before attempting to hail a cab using the first method described here. Also, just as when hitchhiking, use caution! Assess the state of the driver and the car before you get in, and always listen to your gut feelings—if something feels wrong, it probably is. Have fun!